Tourism Whistler employs a diverse workforce in four different key areas: Destination Marketing & Sales Office (Administration); Visitor Services; Central Reservations; and the Whistler Golf Club. Learn more about each area of our organization to understand where your talents match up. As the official Destination Marketing & Sales Organization (DMO) for Whistler, we are responsible for promoting the resort as an international, four-season destination with the goal of increasing overnight visitations. The Marketing Services department is responsible for consumer-focused marketing programs and partnerships designed to increase awareness and engagement with the Whistler brand and drive room nights. The team also provides support to Tourism Whistler's internal departments and stakeholders, along with tools for the membership in developing sales and marketing materials that are consistent with the Whistler brand. The team handles the development and maintenance of content on Whistler.com; engagement with audiences through email and social channels; planning and tracking of advertising programs and relationships with agency partners; development of contests, promotions and partnership marketing programs; and the development and maintenance of branded content and creative assets such as photography. The Conference Sales department is responsible for generating room nights through building the meeting, conference and incentive travel (MC&IT) business to the resort and the Whistler Conference Centre (WCC) through consistent and effective direct sales and marketing initiatives. The aim is to bring large resort wide conference groups to Whistler that impact the whole resort and enhance awareness of Whistler as the ideal meeting destination year round. Strategic alliances with industry partners such as Destination Canada, Tourism Vancouver, Tourism Victoria and destination management companies assist in strengthening our message to meeting planners and third party organizers. The mission of the Conference Services department is to oversee the execution of all meetings, conferences and events/festivals taking place within the Whistler Conference Centre. The department works very closely with the contracted food and beverage provider, Building Operations and Conference Sales in ensuring the utmost experience of our conference guests. The Travel Trade team strives to drive room nights through third party trade partners (i.e. Tour Operators, Travel Agents and Online Travel Agencies). The team works closely with members to offer support in core markets with short to mid-term growth opportunities and emerging markets with long-term growth opportunities. The travel media team initiatives are focused on increasing awareness of Whistler in core and emerging markets by influencing traditional and online media to create positive travel stories ultimately resulting in room nights. The team works at balancing coverage by market and by medium (print, online, social media and broadcast). Communications is responsible for overseeing communications for Tourism Whistler and Whistler. This involves the direction of the news media relations program in addition to other Tourism Whistler and industry-wide stakeholder communications. The Member Relations department is responsible for managing and engaging Tourism Whistler’s Membership. The department is responsible for all Member communications, and for the development and implementation of Member programs and initiatives that increase alignment and support across our Membership. The Member Relations department helps to facilitate opportunities for Members to engage in Tourism Whistler’s activities, and develops enhanced information resources for Members to use. The department is the primary point of contact for any questions from Members or third parties regarding Tourism Whistler’s membership benefits and requirements. The Research department supports strategic decision making among Tourism Whistler members and internal departments by developing and sharing research that provides insights into Whistler's tourism business, product offerings, visitors, potential markets, and competitors. Based upon key business indicators and research findings, opportunities to enhance and expand Whistler’s tourism offerings are identified, with the aim of attracting new guests, increasing length of stay, and increasing repeat visitation. Research resources are focused in two distinct areas: tracking the performance and economic health of the resort; and understanding target markets, trends, attitudes and perceptions. The Web Development and Information Technology (WIT) department is responsible for the development and maintenance of Tourism Whistler's technical infrastructure and for providing strategic leadership to the organization in the areas of software, data analysis, communications, and web technology. The IT Department offers responsive, friendly support to ensure that everything works so Employees can get to the job at hand; improving overall effectiveness and productivity. The Finance Department is responsible for all account reconciliations, payables, and receivables, financial reporting including audited financial statements, budgets and forecasts. The Finance Department will build and maintain professional relationships with Members, Customers and Vendors and will continue to support internal customers in achieving their targets and objectives by proactively providing accurate, reliable financial information. Membership Assessments ensures the equitable enforcement of Tourism Whistler Bylaws as they pertain to mandatory Members, including management of the billing and collection of assessment fees, and administration of the annual election of Directors. In addition, Membership Assessments is the primary contact for any questions from Members or third parties regarding Tourism Whistler's membership payment and administration. The mission of the Building Operations Department is to deliver the highest possible building standards in cleanliness, comfort, safety and quality finishing within the established budgets. The department provides prompt and professional service to internal and external customers and identifies leading edge building technology solutions which economically meet the needs of clients. The mission of the Human Resources (HR) Department is to foster a culture of exceptional service, employee development and high performance ensuring employees are supported, valued and engaged. HR supports the fulfillment of Tourism Whistler's goals and objectives through proactive programs that attract, retain, motivate and develop staff. HR facilitates the integration of employees' personal goals and objectives with organizational goals and objectives, resulting in growth and success for both staff and Tourism Whistler. The Tourism Whistler Visitor Services Department is Whistler's official resource for all in-resort information, activity bookings, and transportation. The Visitor Centre generates economic growth in tourism to Whistler by offering a broad range of products and providing quick, accurate and friendly service. Team members know Whistler and the surrounding areas inside out and will provide information such as fun things to do, bus schedules, driving and walking directions, dining options and maps. Our Visitor Centre employees are the official knowledge library of all that Whistler is. Listening to and understanding visitors' needs, you will provide meaningful solutions, influencing the experiences of each person you interact with. If you love meeting new people and have a friendly and patient demeanor, this would be a great department for you. We offer full-time and part-time year-round positions in our Visitor Centre, as well as summer co-op opportunities. Whistler.com, Tourism Whistler’s central reservations call centre, welcomes visitors to the resort by promoting and selling Whistler vacations through an extensive, user-friendly website and through exciting and effective customer service, product knowledge and sales programs used by our team of talented, in-resort Travel Consultants, thereby contributing to the viability of all resort partners and stakeholders. Travel Consultants work in a fast paced, exciting atmosphere by helping our guests organize the vacation of their dreams. We book accommodation, transportation, air fares, lift tickets and most of Whistler's exciting outdoor activities. While we do require a year round team to ensure the success of Whistler.com, to compliment that team we look for seasonal travel consultants to work throughout the busy winter and summer seasons. Travel Consultants earn a competitive wage, work a great schedule (4 days on, 3 days off), receive $1000 in Wellness Benefits and have the opportunity to experience all Whistler has to offer through many product familiarization tours. If you're going to be telling a guest how incredible a moonlight snowmobile and fondue tour is, we think you should experience it firsthand! Thank you for considering Whistler.com as your place for employment in Whistler, BC! 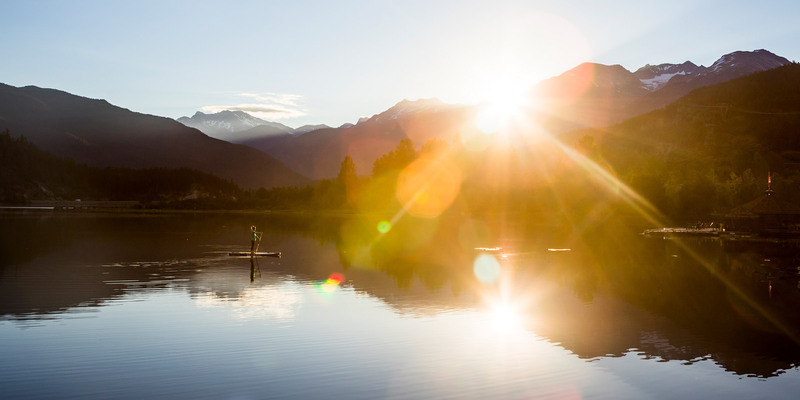 Experience a summer like no other in Whistler! The mission of the Whistler Golf Club is to work in co-operation with its in-resort partners to establish Whistler as the Number One Mountain Golf Destination in North America. The Whistler Golf Club provides leadership to Whistler’s Four Course Co-op by setting the standard for guest service, course conditions, quality facilities and innovative marketing and sales. The Whistler Golf Club looks for individuals who have outstanding guest service skills and an ability to deliver "Whistler's attitude!" Learn more about working at the Whistler Golf Club and view current job openings.